I was getting frustrated that all the information for the wine recipes seemed to be split over different different screens. So, I made a spread sheet with all of the recipes that are currently open to me at Level 11. If you are a higher level and have access to more recipes, please share them, and I'll update the Google Sheet. I hope you find this useful. 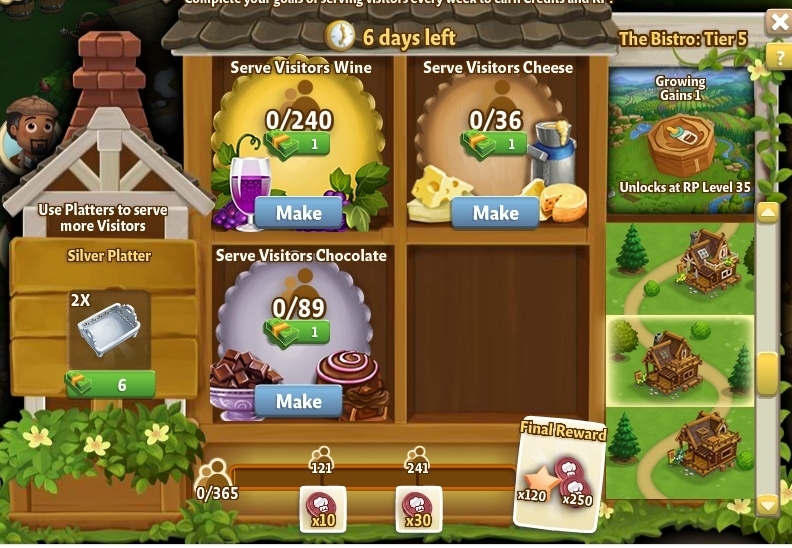 I keep it open in another tab when I'm working my Gourmet Farm and trying to decide which wine recipes to make. Recipes highlighted Green are limited-time recipes (access after you reach your goal for the week). Ingredients in Green are Ask items. Awesome! As you quickly notice, pretty much all recipes follow a 5 grapes -> 1 serving ratio (approximately), this is not even dependent on the amount of time it takes to craft it. The exceptions are the recipes with the ask items, as the ask item takes up half the recipe, these fall into a 2.5 grapes -> 1 serving ratio. As grapes = mulch, you can calculate how much mulch you need daily to complete the weekly goal by dividing by 7 days and multiplying by 5. Note: my Sparkling Catawba requires 14 Catawba and 3 Gelatin Sheets. 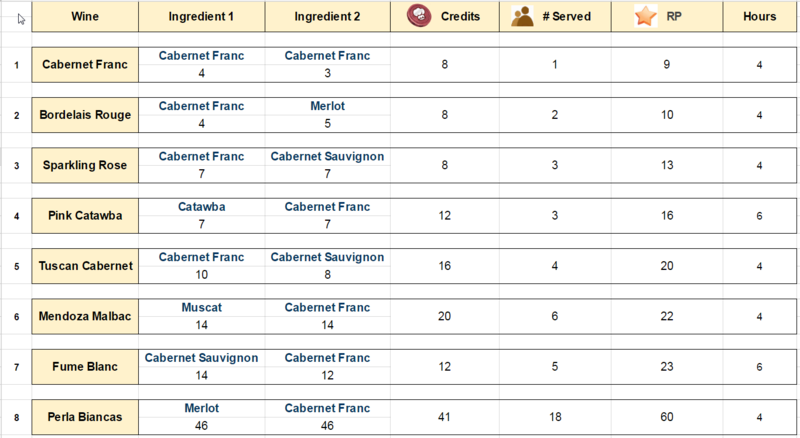 Hope that's a copy-paste error from the Merlot Sheet and not a recipe difference between farms. We can always count on you for the math! Great tip. There are only 4 recipes that I bother doing Carmenere and Vinho Ilho for order servings - Viognier - when I'm about to level up (its a 24 hour recipe so I only do it if I'm leveling or have insta-craft) - and Perla Biancas during bonus time. So far even with a [email protected] drop rate I've had no problem getting to bonus time with these - sometimes I'll throw in the ones with the ask items just because Ive collected them. I haven't done calculations to find out if by only doing recipes with crops that give the lower RP I'm losing potential growing RP but these seem to fit my schedule and they are doing the job. Does anyone know if the limited-time recipes are really only available during bonus time, or are they regular recipes that get boosted RP/Credits during bonus time? LOL that would bring me to the next point: empty plots or planted grapes when visiting? Let's say you have 4 clicks, and click empty plots. You might get 1 mulch out of it, which you can then spend to grow a grape of your choosing. RP wise this nets you 1 for the visit, 1 for mulching a grape on your farm and let's say 2 RP for harvesting it. Total: 4 RP and 1 grape of your choosing. Compare that to clicking 4 grape plots (unmulched or grown). You don't get mulch, but can get a grape (not of your choosing, but whatever you clicked that was available). This has about the same drop rate as the mulch from empty plots, so 1 out of 4 in this example. You don't get to grow a grape on your farm, but you do get RP for clicking the grapes at the neighbour, say the same 2 RP per grape. Total: 9 RP and 1 grape not of your choosing. I don't have any recipes handy except the 3 wine that I do over and over. I do them specifically for RP and no other reason. If I'll be gone all day I do Reisling for 10 hours - I forget the exact RP right now, but it's in the 47-48 RP range and uses 46 total Riesling. If I'll be gone more than a day, I do Viognier for 24 hours. 46 total Viognier (and I love to plant the Viognier because it gives 9RP each at harvest), and 75 total RP. So, for wine, I don't really plant anything else. Carmenere, Reisling, and Viognier. I just recently unlocked Chocolate, but I'm only planting two types of chocolate as well. There only seems to be the one recipe worth doing in there. They are all 4 hours to harvest, but the Milk Chocolate Truffle gives 60RP. The two crops used are Theo-something (24 of them, 2 mins each) and Trinit-something (22 of them, 3 mins each). So far, all the chocolate I unlocked to plant gives 11RP when harvested. I really never thought I'd be so excited about getting an extra 2RP...but I was! For the most part, I determined the best recipes by scrolling backwards and checking the RP. They appear to be listed by RP in each building, so the best crafts are going to be at the end. So, there will be crops with longer grow times coming up? That's good to know. The "bloom" on the farm for leveling up is totally worthless when all you have to grow is 1-2 minute crops. It's like "whew, shaved 45 seconds off that grow time!" Yay, me? I'm sticking to Carmenere and Vinho Ilho at bonus time. My drop rate is also [email protected] !!! After reading some of these great informative posts I'll be clicking on neighbours' grown or already mulched plots in future!! You don't get to grow a grape on your farm, but you do get RP for clicking the grapes at the neighbour, say the same 2 RP per grape. has anyone tested it with a plant that gives more than 2RP? or is the 2RP just standard? Can it be un-mulched? or do they have to be able to harvest it? Edit ~ I just went and saw @Colleen Murphy - she had 2 plots of this Trini(noideahowtospellit) chocolate that was un-mulched, and 3 that were ready to harvest. I only got the 2 RP for harvesting, and only 1 RP for mulching. Yeah, I ran more visits and found it's a default 2 RP. Though I could have sworn it was only 2 RP for unmulched items, and 1 RP for harvest ready items or mulching empty plots. RP wise, going for the mulch from empty plots is probably more effective, but this will depend on your drop rate. Thank you @Christine~~ for having every variant out... and sorry for the random clicks. Even the wine barrel gives 1 RP when clicked, so it looks like every click is just worth 1, and mulching unmulched items gives you 1 extra for the mulching... or something. 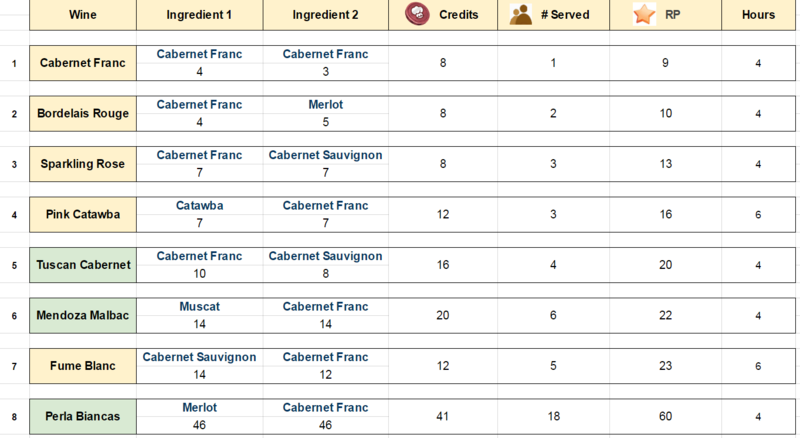 I have made a list of the wines above LV10. The information is taken from the lower right corner of the grocery store pages. There are still some information waiting to be added in the future, such as the ingredients numbers, coins and credits. I hope it will have some help. Note 1: My G-Farm is at LV10 right now, so the information details aren't very well. 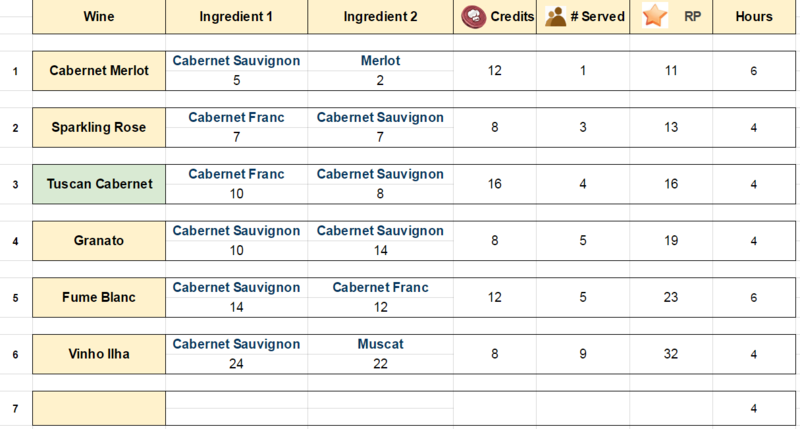 Note 2: All of the wines' Exp points are 9 Exp. They changed gameplay today so it doesn't work like this anymore... I'd appreciate an updated chart if you have time/are willing. I think I'm done with the gourmet farm with this update. True, it's not really an upgrade it's more like a downgrade and a screw you. You can no longer get credits for individual recipes. And the amount of credits one can get is limited. Expansions are also for credits now, rather than by level, so those players that played faster than you had more time could get the expansions. The addition of the quests doesn't really help because it's more confusing than being centralized. The only solution is to complain at Zynga and say that suddenly changing gameplay makes the expansion pretty much defunct for you and they've wasted manhours making it. I need a sign for my GF that says "On Strike" or maybe just "I Am Done". Have to look in inventory to see if I have an extra kicking around. Will someone tell Zynga that this a second farm not a first one. I was under the mistaken impression this would be an easy little farm to supplement our main farm. These changes will make it just as difficult to do the GF as it is to do the main farm. I am VERY disappointed. You can do that by hitting "Support" and then the "Contact Us" and complain about the changes. I gave them some suggestions so it lines up with they want to do v. what they are doing.... They do listen to their users... I sent some suggestions last year for upgrades that we're seeing now. The really unfair part is that those of us who did not do the 'level up glitch' to get to the upper levels on the GF now have to pay a penalty for playing the game without using glitches to get ahead. Everything else is an adjustment that I could have probably maybe perhaps gotten used to with time, but that ticks me off. Same thing happened to expansions on the main farm - they suddenly required favors and all those who had their expansions already didn't have that problem. ONLY accepting zfriends. Not accepting new neighbors right now because I don't have time to visit the ones I have and because we can't delete them anymore. Sorry! Yeah, that annoys me most, the fully expanded high level players with an inexplicable x2 mulch per neighbour visit,( as opposed to x 3 for players 70 levels below them) can sit smugly on their expanded Gourmet farms. *HINT, your Bistro didn't catch up when you used the cheat!! While I am expected to battle it for maybe years to reach that position..LOLOL .. Not Happening.